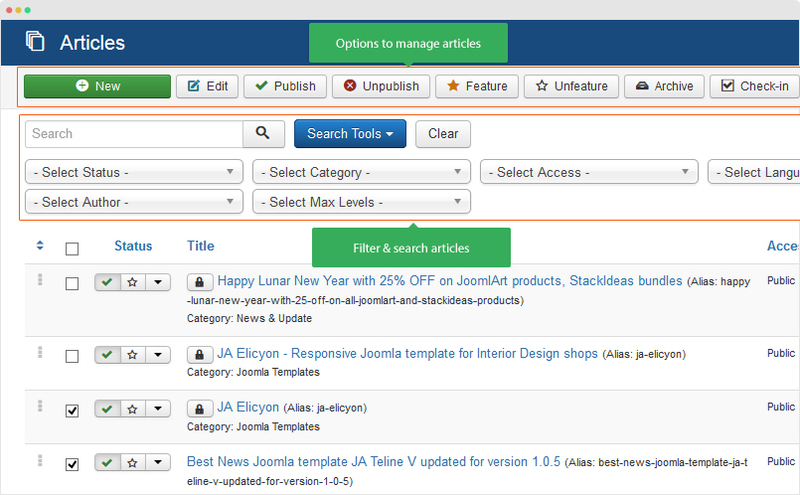 What is Joomla articles ? 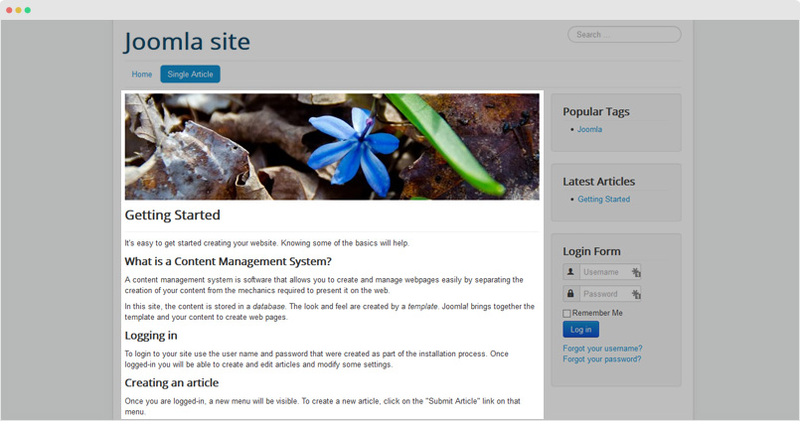 Joomla Article is a piece of content consisting of text, links to other resources, image, media, ect. Articles are the basic units of information in the content system and the bottom level in the content hierarchy. 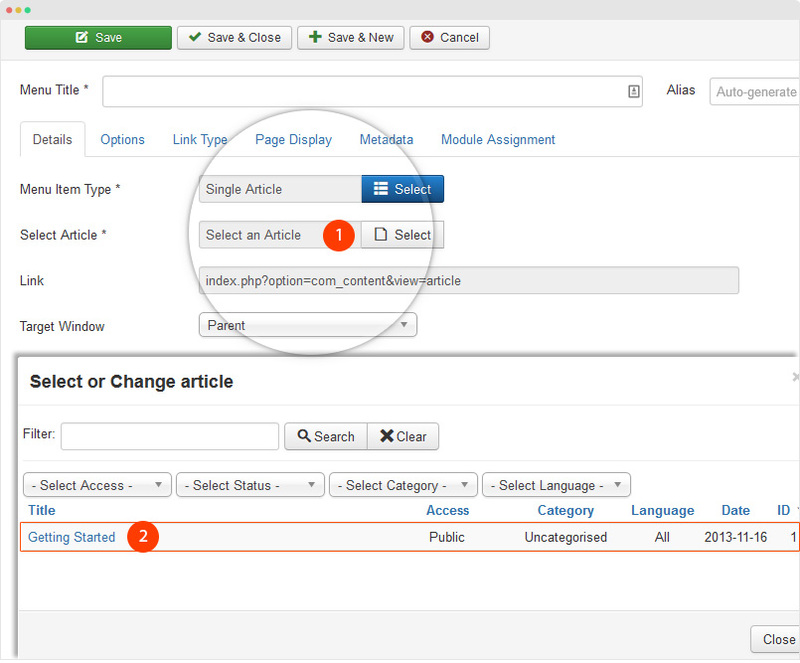 Access your site back-end, go to: Content → Article Manager and hit the "New" button to create new article. 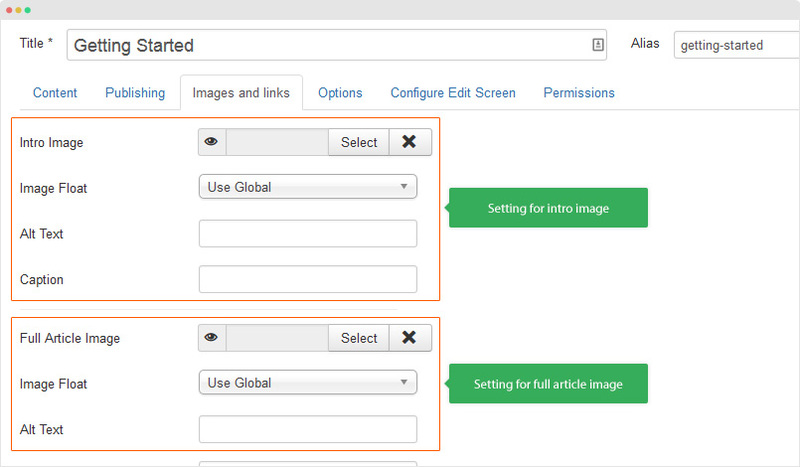 In the adding new article page, add article title, article content and assign it to a category. The intro image is to display in article listing page, the full article image is to display in article detail page. You can embed image in any position in article content, use the format below. But please note that, you have to disable the editor so you can add HTML markup to your article. Back to the article management page, all the created articles will be listed in this page. 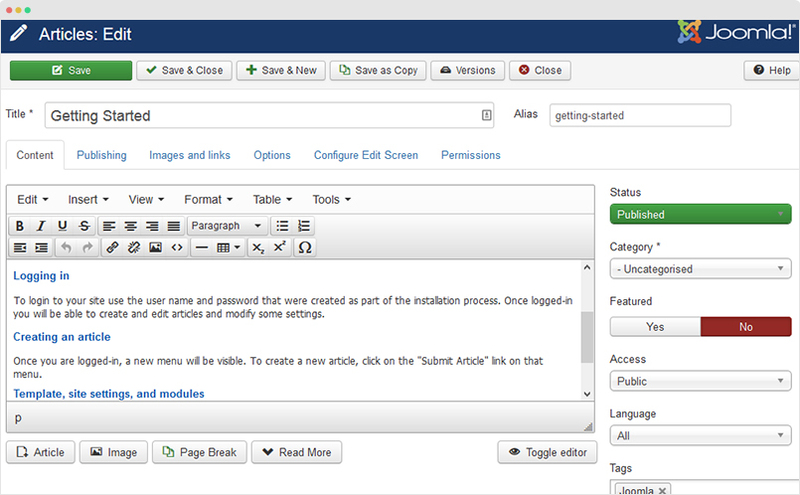 In the header, you can see list of options to manage articles, select articles and hit the option. To search and filter article, click on the "Search Tool" to open all filtering options. 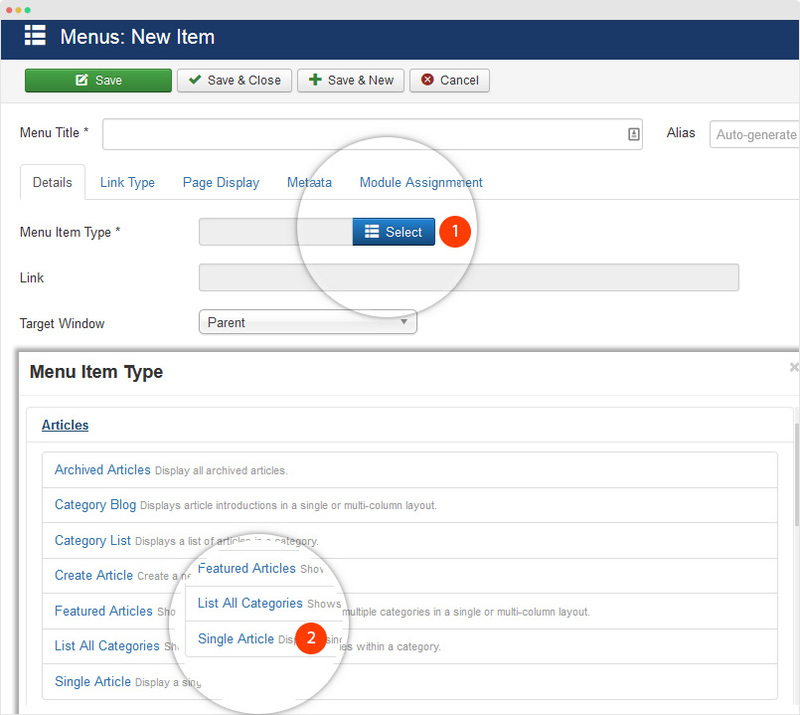 To display an article in front-page of your Joomla site, the standard way is link it in the menu of your website. To do this, we will create new menu item. Go to Menus → Main menu → Add New Menu Item. Next, assign article you created, configure other fields and save the menu item. Done, open your site front-end to see how the article is displayed. 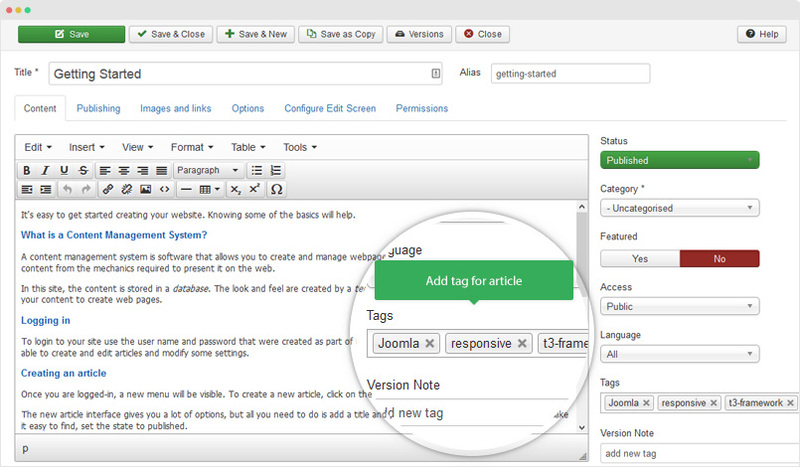 Tags is new feature represented in Joomla 3, Joomla Tags provides a flexible way of organizing content, the same tag can be used for different articles (Tag is applied for other content types: Categories, Weblink, Contacts, Newsfeeds). Once an item is tagged with a specific tag, browsing to the link for that tag will give a list of all items that have been tagged with that tag. Once an item is tagged with a specific tag, browsing to the link for that tag will give a list of all items that have been tagged with that tag. You can browse to the Tags manager (link on the Components menu). There you can create detailed tags in a way similar to creating an article. Besides a name, tags can include a description, images, meta data and other items similar to all other Joomla content types. In the Tags Manager you can also choose a parent for a tag to create nested tagging. You can add tags for article in the article editing page, just type tag in the "Tags" field. By default Joomla! will display tags embedded in each item that has been tagged. You can turn this display off by changing the parameters. You can create a menu link that displays a list of tagged items for a given tag and display either as a list or blog style.